The Christmas Season is my favorite time of year. However, with all of the fun this time of year has to offer, it is sometimes difficult to remember the true meaning of Christmas. This white stocking Christmas poem is a simple way to remember Christ during the Christmas season. 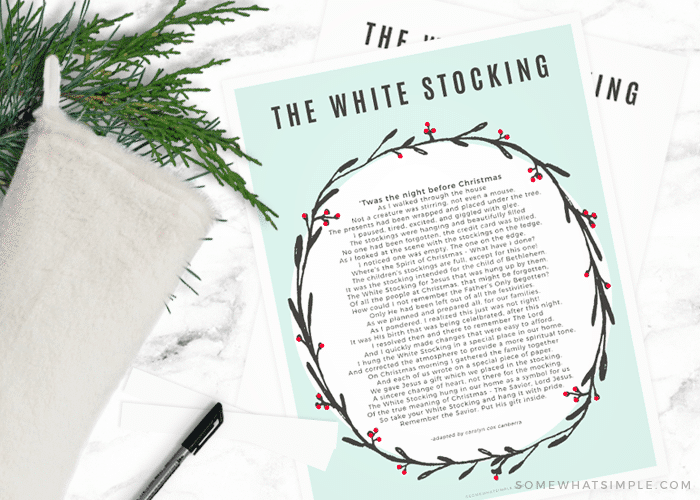 When my friend shared with me the tradition her family does each year called The 12 Months of Christmas, I absolutely LOVED the gift that was given on the 12th month of the year – The White Stocking. I was looking for ways to create a more Christ-centered holiday season, and this one is not only meaningful, but it is simple too! 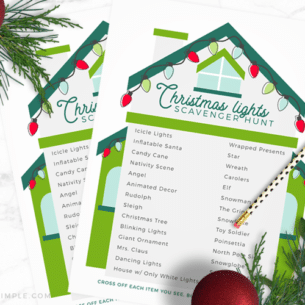 All you need is a white stocking and the white stocking Christmas printable below to get started. Each year we hang a white stocking in a special place in our home. On Christmas Eve we gather the family together and each person writes on a piece of paper a gift for Jesus that is then placed in the stocking. Gifts could include personal goals you wish to achieve, family goals, ways you will be of service to others in the coming year, or relationships you wish to improve. We keep all these gifts in the stocking until next year’s Christmas Eve when our family is together again and we pass out the papers from the year before. 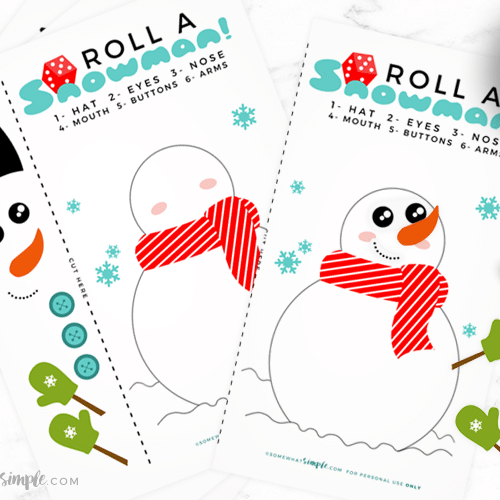 It is a fun tradition and such a simple, meaningful way to spend Christmas Eve. Want to Start Your Own White Stocking Christmas Poem Tradition? 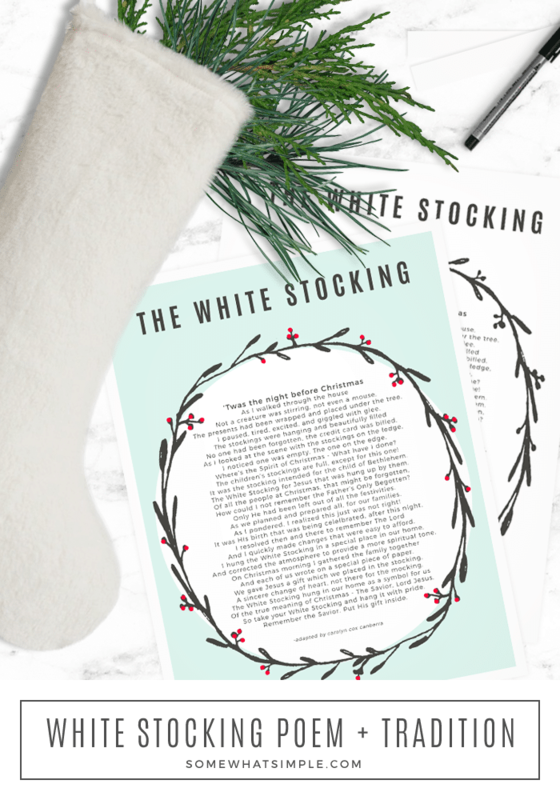 Our White Stocking Printable comes with a full color version and a black and white copy if you want to save your printer ink. 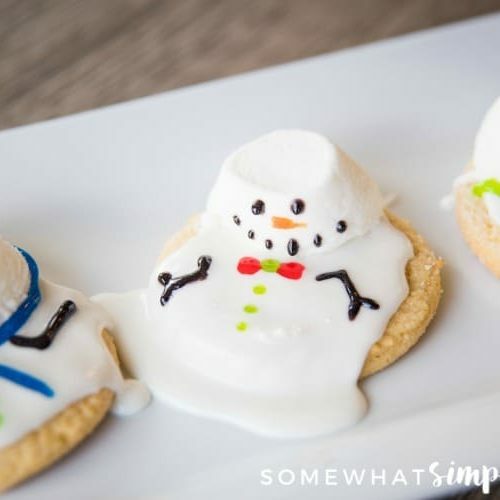 We’d love to hear about any other Christmas traditions that you do with your family. Leave a comment below and tell us all about them!